Christian stewardship is the dedication of one's time, talent and treasure to the glory of God, in response to God's gift to us of life and of new life in Jesus Christ. To be a good steward is always to be responsive to the trust placed in us by God. The environment, other creatures and other human beings are not ours. They belong to God. We have been asked to care for them and are endowed with the capacities for that care. So Christians, among others, are asked to care for nature, for the young, the old, the less fortunate, and for those unable to care for themselves. A pledge is a financial estimate of what one intends to share with God at St. Andrew's Church in the year to come. This giving, in response to God's gifts of life and love, is called an act of stewardship. God's desire is for a world of meaningful connections, prayer, compassion, hospitality, hope and peace. This is the mission of the church. Our compelling interest is that the church be supported adequately to do the right things for the right reasons. It takes a commitment from each of us to work with God in making a difference in the world. A simple guideline is to pledge an amount that represents a genuine commitment given your income and the importance of your relationship with St. Andrew's in your life. Visit our Proportional Giving Chart for help in determining your pledge amount. Planned gifts are those made in estate planning documents or other ways, such as life insurance beneficiary, stock donations, charitable gift annuities, gifts from retirement accounts, charitable trusts, or private foundations. 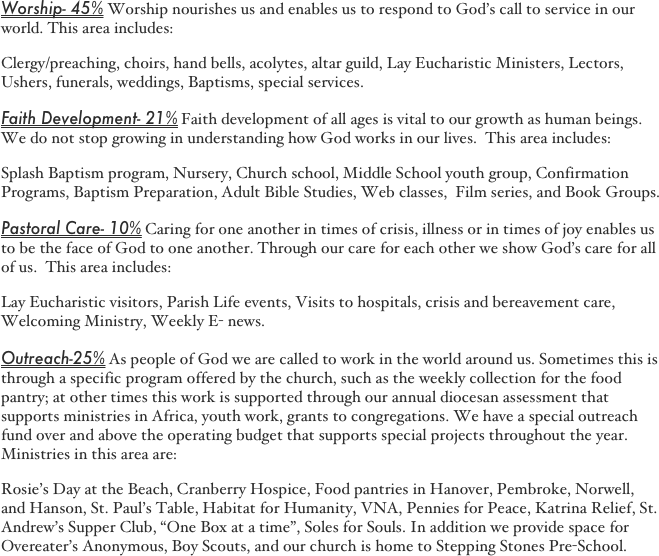 To learn about our financial goals and what it costs to run St. Andrews, Hanover, scroll down.